Starting with each building behavior needed, gradually ‘shape’ the more complex behavior by setting small, achievable goals that can be positively reinforced. Every dog learns at his own pace. Therefore, he will learn the new behavior, when he totally understands the behavior. 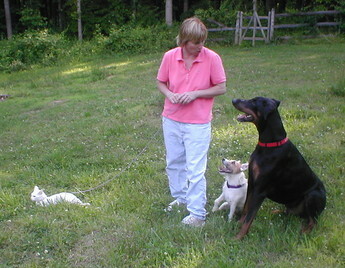 Sometimes, giving the animal a day to a month off from working on the behavior, allows the animal time to think about what he and his trainer were working on and to figure out what the trainer wanted. Often after a short break, the animal will not only understand and perform the behavior he was working toward before the break, but will go one or two steps beyond the behavior, to demonstrate not only that he understands the behavior, but that he understands what comes next!